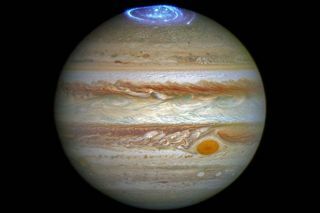 Jupiter's magnetic field channels charged solar particles to the poles, creating brilliant auroras. DENVER — Jupiter itself isn't a great candidate to host life, but the gas giant is playing a significant role in the search for habitable worlds. In a planetary-science first, astronomers used their knowledge of Jupiter's magnetic field to model what kinds of radio signals might be emitted naturally by the fields of smaller, rocky worlds. "These magnetized Earth-sized planets would then be possible candidates to investigate further, looking for biological signatures, such as water vapor, in a search for life," he added. Turner is using Europe's Low-Frequency Array (LOFAR) to measure radio waves produced by Jupiter, to determine how radio waves could be separated out from background noise. He presented his results Monday (June 4) here at the 232nd meeting of the American Astronomical Society. "The goal is to determine up to what distance, and with what strength, radio emission from exoplanets can be seen using LOFAR," Turner said. This artist's illustration (not to scale) shows a cross section of Earth's magnetosphere (the protective shell created by the planet's magnetic field). The magnetic-field lines are in blue, and the solar wind is in yellow. Many of the planets in our solar system have magnetic fields generated by their iron cores. Mars once hosted a planet-wide magnetic field, and its loss resulted in the disappearance of most of the Red Planet's atmosphere and all of its surface water. In contrast, Earth's magnetic field protects our world from the sun's radiation and the charged particles of the solar wind, helping to keep it habitable. "Earth's magnetic field acts like a giant force field," Turner said during a news conference here Monday. So finding other rocky planets that have held on to their magnetic fields can help researchers find potentially habitable worlds, he added. To better understand how well today's technology could spot magnetic fields around other planets, Turner turned to Jupiter. He scaled the emissions from Jupiter's magnetic field to mimic those of distant exoplanets. He found that LOFAR could spot an exoplanet 65 million light-years from Earth if the exoplanet's magnetic-field brightness were a million times stronger than the peak level of Jupiter's. To generate a signal that bright, such a planet would need to be extremely large, Turner said. However, a world that shined so brightly in radio light could possibly have Earth-size moons, each with its own protective magnetic field. This is not such a far-fetched notion; after all, Jupiter has more than 60 known moons, several of which — especially the ocean-harboring satellite Europa — may be capable of supporting life. "This finding is consistent with theoretical models that predict such strong radio emission can exist, and can be used as a guide to search for radio emission from exoplanets," Turner said in the statement.